As already underlined, printing – transferring the image contained in the negative on the paper – is the most creative aspect of the whole photographic process. According to the photographer´s temperament, and by using different techniques and different papers, it is possible to create an extremely wide spread of expressive nuances. Like a painter with the endless combinations his palette can create, the photographer can shape a range of sensations and emotions, and above all shape his personal vision: the emotion felt when the film was exposed. The moment of the exposure is only the first of a series of complex steps that create a gelatin silver print. 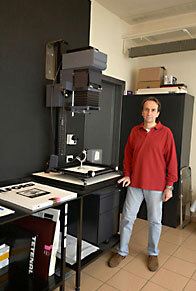 It is followed by the development of the negative, the making of the first contact print, then by the first prints on different papers, so that the potential of the negative is fully investigated. Afterwards many further prints are made before getting closer and closer to the definitive Fine Art print. To give the idea of the complexity of the printing process, we shouldn´t forget that Ansel Adams, one of the most important photographers of all times, in some cases spent even decades before reaching the result he had in mind, before succeeding in seizing the magic of the moment. Beside the aspect of creativity, there is the equally important aspect of preservation. In fact the gelatin silver print is unstable, although it is more stable and has a much longer life than any digital print. The reasons of decay can be chemical or biological and may affect the image, the binding agent, or the paper. For this reason the type of chemical treatment used when developing and a perfect washing are essential in order to guarantee the print the longest life-span. This is what is called “archival stability”, a process that allows prints to last unaltered even for more than two hundred years. For US photographers archival stability is a basic issue which has been held in due consideration since many decades. In Italy this aspect is not yet well known. The concern for preservation is present also in other steps of the photographic work. It is necessary to keep in a suitable environment both the unexposed and the exposed materials, the chemical solutions and the products used in the darkroom, and of course the Fine Art prints. Photography should be considered not as a “consumer good”, but a “durable good” and an expressive art form which needs to be protected. For this reason the issue of preservation is so relevant. Luckily on the market today there are high-quality products that guarantee a perfect archival stability to a print, as long as this has been properly developed and properly washed. In my daily work in the darkroom I pay the maximum attention to the aspect of archival stability, although this is very demanding in terms of time and money required. In fact my prints undergo two fixing treatments, both with fresh chemicals, followed by a selenium toning treatment, then by a hypo-clearing bath and by a final wash of one and a half hours in a professional vertical washing machine at a temperature between 18 and 22 Celsius degrees.